After initial training under Rajalakshmi Krishnan (disciple of Chembai Vaidyanatha Bhagavathar) and violinist T.V. Ramani at Thrissur, Sreevalsan J Menon had much of his advanced tutelage under the late Neyyattinkara Vasudevan. Menon is an ‘A’ grade artist of All India Radio and has given concerts all over the country including the National Concerts of AIR and Doordarshan. He has received several awards including Kerala Sangeetha Nataka Akademi Award 2013, from the Madras Music Academy, and a title from Krishna Gana Sabha, also in Chennai, besides such institutions of repute in the Deccan. He has also participated in Music Transcends, a symphony held at Washington, D.C. in 2004, integrating Western and Indian classical music. 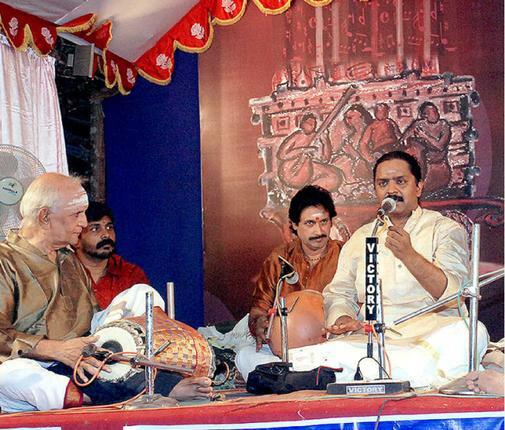 His jugalbandis with Hindustani vocalist Ramesh Narayan and late Kathakali musicians Kalamandalam Sankaran Embranthiri and Kalamandalam Hyderali have been widely appreciated. Thanking the original uploader Sri. Lakshminarayanan Nurani Chudamany. Recorded and uploaded without any commercial intentions..or monetary benefit.. mainly for educating new entrants to Indian Culture and for listening pleasure..